E00 is an ASCII-based ArcInfo ‘export’ format. It was used in earlier days to transfer (‘export’) data files from ArcInfo format to other GIS applications. In previous years, attempts were made to use it as standard GIS exchange format, but it never became accepted by the international GIS community. Survey Department is still using this format as exchange format to deliver some data. Main menu > File > System set up > Preferences > Set up window: Preferences > Miscellaneous > Box ‘Assume shape files in feet’ must be un-checked. 1. import71 converts from E00 to ArcInfo coverage format (see Annex 7 for installation of import71). The process is menu driven. Be aware, to enter the output data source without file extension, just the name only. It should close with an ‘Import Complete’ message. The output is a new folder with some 10-20 files, which is the standard ArcInfo coverage. 2. 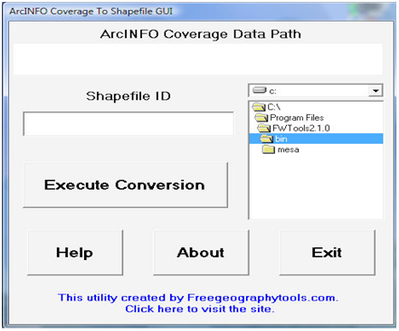 ArcInfoCoverageToShapefileGUI, based on ogr2ogr in FWTools, will convert the file from the previous step to shape file in a menu-driven way (see Annex 7 for installation of FWTools and ArcInfoCoverageToShapefileGUI, which can be supplied from TCPD-HQ-GIS on request). This process is menu driven. At the end, this shape file is to be converted to a Map Maker DRA file. This is explained in Chapter 5.4.1 (Import GIS data from ESRI/ SHP format).